Israeli soldiers attacked, Friday, a nonviolent Palestinian protest in Hebron, in the southern part of the occupied West Bank, causing many to suffer the effects of teargas inhalation. 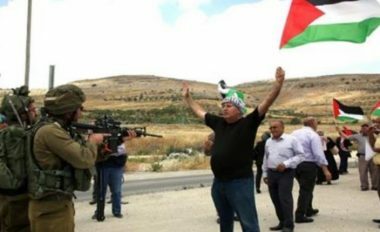 Dozens of residents marched in Khirbet Qalqas area, south of Hebron city, demanding the Israeli army to reopen its main road, which was has been blockaded for the last eighteen years. The nonviolent protesters marched while chanting against the ongoing illegal Israeli occupation and violations, and calling for liberation and independence. The soldiers assaulted the protesters with gas bombs and concussion grenades, causing many to suffer the effects of teargas inhalation. Khirbet Qalqas: Home to some 3,000 people, is a neighborhood in southern Hebron. It used to be an independent village and is separated from the rest of the city by Route 60. The lives of Khirbet Qalqas residents naturally revolve mostly around the city: many of them work and do their shopping in Hebron and go there for health and education services. For instance, the farmers sell crops in the vegetable market in Hebron’s city center, and about 100 high-school and university students go into the city every day to study. There are four roads leading in and out of Khirbet Qalqas. The main one, to the north, connects the neighborhood directly with Route 60, and from there with the rest of the city. When the second intifada broke out in 2000, the Israeli military placed dirt and rock piles on either side of Route 60, so the neighborhood residents can no longer use the road. For more than 17 years, in order to reach Hebron’s city center, residents have had to take one of two other routes instead. Each entails difficulties and risks: One option is to walk from home to Route 60, climb over the pile of dirt of stones placed on one side of the road, cross the road, climb over the pile of dirt and stones on one other side of the road (about 150 meters all told), and find a taxi that will take them to Hebron city center. Crossing the highway is very dangerous: from 2014 to 2017, five Khirbet Qalqas residents and one from nearby a-Rihiya were fatally run over as they crossed the road, two of them children. The other option is to take their own car or a taxi (costing about NIS 50 [USD 14]) from home to the city center, and drive along a bypass route some eight kilometers long. The drive sometimes takes more than half an hour, as it passes through the al-Fahs Checkpoint (“the Sheep Checkpoint”). The checkpoint is at an intersection with Route 60, south of the area defined H2 where Israeli settlers live, and near the industrial zone. It consists of two long iron gates placed on either side of Route 60. The gates are open most of the time, but are usually staffed by soldiers who inspect the vehicles passing through and detain the passengers for varying lengths of time.